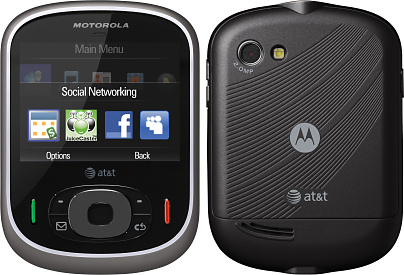 Motorola's mobile phone designs range from the very conventional to the exceptionally radical. But the Motorola Karma QA1 falls into an awkward spot between the conventional and the radical, and the result is a strange looking device that doesn't seem quite right. At first glance, it looks like someone has taken a normal slider phone and has somehow stretched it so that it is much wider. The reason for this peculiar layout is obvious when you slide the Karma QA1 open - there's a full QWERTY keypad underneath. Perhaps this design makes a little more sense when you realise that it is aimed at the US only where it will be available on the AT&T network. 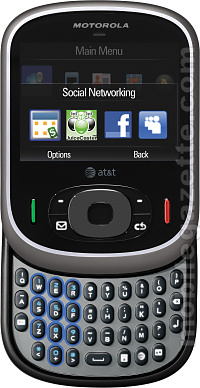 Here, it finds itself competing directly against devices like the Sidekick in the personal messaging and social networking market. The Karma is designed for use with SMS, instant messaging and email. It also supports many popular social networking sites such as Facebook and Myspace. The Motorola Karma QA1 also features GPS, which can be used for turn-by-turn navigation or location-aware services. As you might expect, the Karma QA1 comes with a multimedia player that can handle most things, but not Windows Media formats. There's a standard 3.5mm audio socket, internal memory is 100Mb and this is expandable by up to 16GB using microSD cards. The rest of the Karma's specifications are fairly modest. There's a conventional 2.5" 320 x 240 pixel display, a 2 megapixel camera, USB 2.0 and Bluetooth 2.0 connectivity. It's a 3G device, with support for US 850 / 1900 MHz UMTS, so if you're roaming to Europe then you will need to fall back to the Karma's quad-band GSM and GPRS / EDGE data. The Motorola Karma does not support WiFi. Talktime on 3G is about 3.6 hours with up to 15 days standby time, which is surprisingly short given the relatively large 1170 mAh battery. Talktime stretches to 5 hours if used on GSM only. It is a peculiar size - coming in at 88 x 64 x 18mm (or 3.46 x 2.52 x 0.7 inches) and weighing a fairly hefty 141 grams or 4.97 ounces. But the Karma QA1 is a lot more pocket-friendly than T-Mobile's Sidekick range, and it does seem well suited to its market. The Motorola Karma QA1 is available now exclusively on AT&T Wireless at a price of around $80 with a contract and mail-in rebate.